You have not selected a member. 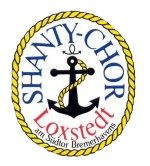 Click the note icon to save Shanty-Chor Loxstedt as a cookie. Thursday, 08.08.2019 13:00 - 11.08.